► Final Paper Guidelines.. click here.. 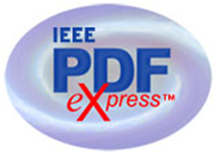 The submissions which do not meet IEEE Xplore PDF speicifcation will be withdrawn automatically. Enter '38419XP' for the Conference ID, your email address, and choose a new password. Continue to enter information as prompted. Enter '38419XP' for the Conference ID, your email address, and enter the password you used for your old account. When you click 'Login', you'll receive an error saying you need to set up an account. Simply click 'Continue'. By entering your previously used email address and password combination, you will enable your old account for access to this new conference. Enter '38419XP' for the Conference ID, email address and password. All submitted papers will be subjected to a "similarity test" by EDAS paper similarity checker. Papers achieving a high similarity score will be examined and those that are deemed unacceptable will be rejected/withdrawn without a formal review. The manuscripts should be submitted in PDF format. Please compare all author names in EDAS with the author list in your paper. They must be identical and in the same order. Accepted and presented papers will be published in the conference proceedings and submitted to IEEE Xplore as well as other Abstracting and Indexing (A&I) databases. Independently of the presentation type, all papers are included in the proceedings. To be published in the ICACCI 2016 Conference Proceedings, an author of an accepted paper is required to register for the conference at the full rate. All accepted papers MUST be presented at the conference by one of the authors, or, if none of the authors are able to attend, by a qualified surrogate.